﻿ Multi-Color -XIAMEN ZHONGJINGTAI BUILDING MATERIALS CO.,LTD. We are specialized in manufacturing & exporting Natural Granite & Marble & Quartz countertop / vanity top / island top for residential and commercial projects with good price . 3 Color: White, Black, Red, Green, Blue, Grey, Brown, base on samples. and other no-standard panels size. d)-Island: 72"x36", 96"x36", 96"x40", 108"x44"
for airport, metro, shopping mall, hotel. 1.Natural Beauty: Artificial Quartz is made from over 90% of quartz. The natural quartz in Artificial Quartz delivers distinctive depth, brilliant clarity, glimmering radiance and a cool, solid feel unique to natural stone. 2.Stain Resistance: Artificial Quartz is no air pore and therefore it is highly resistant to stains from coffee, wine, tea, fruit juice, olive oil, makeup and many other common household products. 6.No Radiation: Artificial Quartz has no side effect to directly touch food and body. It is green to environment without any radiation. Artificial Quartz is suitable for kitchen countertop, floor tile, wall tile and so on. 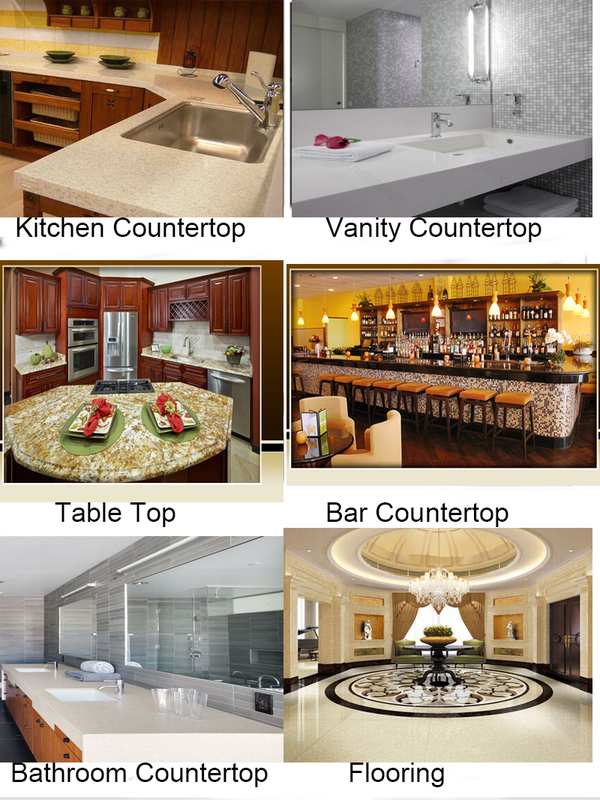 Kitchen Countertop, Vanity Countertop, Table Top, Bar Counter, Bathroom CounterTop, Flooring, Wall etc. Different styles, colors and sizes are available. 10 years' experience in stone supplying, professional knoledge of stone products. b. Our cost man will select the right quarry for your orders. Our QC will check products pc by pc before packing. We always send out containers within agreed time. 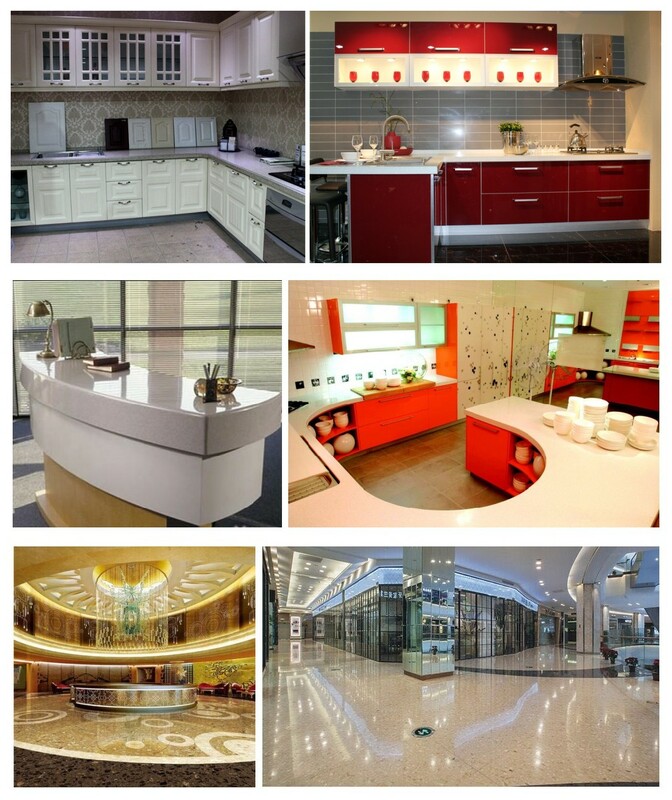 Our mainly products contain quartz countertop, quartz vanity-top,quartz big slab,quartz slab,quartz cut to size tile. 3. What is your delivery time? 5. How about the samples? The samples is free, but the delivery cost will be on ur account, and we will deduct it after you place the order. 6. What is your time of making samples? Usually we will take 1~3 days to make the sample. 7. What is your payment terms? Normally we accept 30% T/T in advance,70% after shipment. 8. What is the shipping port?